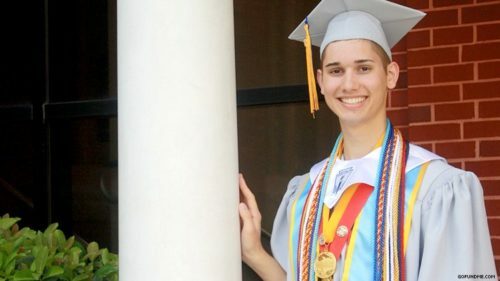 A gay teen’s parents kicked him out of the house. It didn’t stop him from being the best. Editor’s Note: This story has been updated in a separate article. After raising more than $120,000, the fundraiser has been closed and Georgetown University has offered to pay all of Seth’s tuition in full. Click to read updated story. Seth Owen isn’t your typical teenager. While his story may be all too common, he wouldn’t settle for anything less than a happy ending. His ultra religious parents found out he is gay by snooping in his phone. They exploded, forcing him into harmful “ex-gay” conversion therapy. With his parents in control of his life, Owen went to the counseling sessions and busied himself with school activities to avoid home. “I guess you could say it was easier to try to avoid home. I felt like I was doing something good with the struggle instead of doing something damaging,” Owen told Jacksonville’s News 4. But when Owen wasn’t “cured,” his parents did the worst thing they could. They pitched him out of their home and cut off all contact and support. Now homeless, he slept on friend’s couches and worked almost full-time to support himself – and he continued to give his all to his schooling. And despite all the adversity, he graduated as his class’s co-valedictorian. While Owen was accepted to Georgetown University, but without his parents’ financial support, it seemed likely he wouldn’t be able to afford the tuition despite a large scholarship. One of Owen’s teachers organized a GoFundMe for him. “Seth was admitted to Georgetown University and received a financial aid package based on the premise of parental support,” Jane Martin wrote on the fundraising site. Over 700 people donated to the GoFundMe, raising well above the requested $20,000 he was lacking. As of press time, the fundraiser had pledges totally almost $50,000. A request for comment from Georgetown University was not returned.